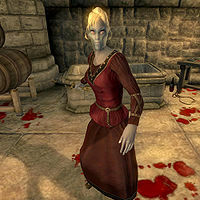 The Pale Lady is a bloodthirsty Dunmer vampire who can be found hiding out beneath the Castle Skingrad. Taking advantage of a secret passageway, she regularly feeds on prisoners in the Skingrad jail cells. She is always hostile toward you, and is killed during the Lost Histories quest. She spends all day in the secret room, waiting to be confronted. During combat, she will occasionally announce "I will feed the mistress your blood!" or "You will be sweet, bloody nectar for the lady.". "The mistress" probably means Countess Rona Hassildor, who lies in a coma caused by her refusal to satisfy the demands of her vampirism on live victims. The bottles of human blood near the Pale Lady suggest that she collects the blood of her victims to feed to the countess. In the Skingrad Castle dungeon, you will encounter Larthjar the Laggard; incidentally, when asked about Theranis, he will be the first one to mention the Pale Lady: "You mean the thief? He was in the big cell with that Argonian. They were always whispering to each other. The Pale Lady took him days ago." When asked about the Pale Lady he will tell you: "Every few days she comes for one of us. Some return, some don't. Those that are taken three times never return. This was Theranis' third time." When asked about where she takes them, he will say: "I don't know. She took the Argonian less than an hour ago though. He put up quite a struggle. He was bleeding all over the place." From his prison cell, Amusei has a good view to several bottles of human blood, the corpse of Theranis and the Pale Lady. When approached, he will provide additional information of the mysterious Pale Lady. On Theranis, he will say: "Theranis? How did you know about him? He was my cellmate. At least until the Pale Lady took him away." and will continue: "After the first time Theranis was taken by the Pale Lady, he knew he was going to die." On the Pale Lady, he will comment: "Filthy vampire! She took my cellmate Theranis a few days ago. If it hadn't been for you, I would have been next." Other than the two prisoners, the only person who notably knows about the Pale Lady is the Skingrad Jailor. If asked about the Pale Lady, he will say: "Mina? You don't want to go asking about her. She... um... interviews prisoners. She isn't one to be crossed." The Pale Lady wears a set of middle class clothing: a burgundy linen shirt, burgundy linens and a pair of russet felt shoes. She is armed with a leveled dagger and carries the key to Skingrad Castle along with the key to the secret cell. She has the standard Vampire bonuses (fortify various attributes, all magical skills, and resist paralysis, normal weapons, and disease) along with the Sun Damage and Weakness to Fire that come with progressing vampirism (lack of blood). She also has the "Embrace of Shadows" spell which gives her a Night Eye and Invisibility effect, and the Hunter's Sight which gives her Night Eye and Detect Life. Although she was only supposed to be enabled during the Lost Histories quest, due to a bug in Amusei's scripting she will appear before this if you happen to enter the secret passage in the Skingrad Castle Wine Cellar, and will inevitably fight you to the death. This won't cause any problems with the Lost Histories quest, other than continuity errors, such as how she was able to imprison Amusei when she was already dead. However, the Unofficial Oblivion Patch introduces another bug in the process of fixing this; if you find the secret room before having infiltrated the dungeon and talked to Larthjar, she will not be present. Progressing the quest by talking to Amusei will prevent her from ever appearing. The Lost Histories quest stage must be exactly 40 for her to appear, but stage 40 is optional and can be missed if you don't talk to Larthjar. You can use the console commands: prid 000838CF, enable to fix this. She doesn't drop vampire dust when she dies.